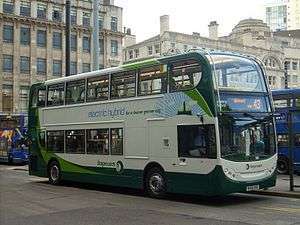 Greater Manchester bus route 43 operates in Greater Manchester between Manchester Piccadilly bus station and Manchester Airport. ↑ Greenaway, Graham (10 September 2007). "All-night bus links Manchester Airport to town". Flight Hotel Reservations. Retrieved 3 April 2010. ↑ McGinty, Craig (12 September 2007). "All night bus service to Manchester Airport". Cheapflights. Retrieved 3 April 2010.